This classic Peaceful Acres area rug will bring durable sophistication to your decor. The rug from The Gray Barn features gorgeous colors, arranged in a geometric oriental pattern with a leafy border. The hand-tufted rug is made from polypropylene, making this comfortable piece an excellent choice for your home. Dimensions 64.0 In. X 29.0 In. X 10.0 In. Very Pretty, but . . . I received my rug today. I ordered the gray version. In the picture, the rug looks more faded and antiqued, which is what I was hoping for. In person, it doesn't look faded at all. Also, I was expecting the gray to be more prominent, but really it's a cream colored background with very little gray in the design sections. The room I'm using it in has light gray walls so it's not a bad thing that there's only a little gray in the rug; there's enough to compliment the wall color without looking drab. That being said, it is a really pretty rug and I will definitely keep it. I just wanted to give an accurate description of the rug to manage expectations. If you like sophisticated old world charm, this is the perfect area rug for you. I am delighted about this area rug because it doesn't shed and it's easy to spot clean when my Bichon Frise pees on it. I purchased this area rug a year ago and still looks brand new. This rug is not too thin or too thick. If you have wood floors and light colored wood furniture, this area rug will look amazing. 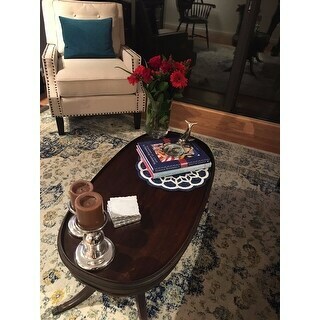 I recommend the Persian Vintage Fancy Rug to anyone who loves a classy and French royal decor. 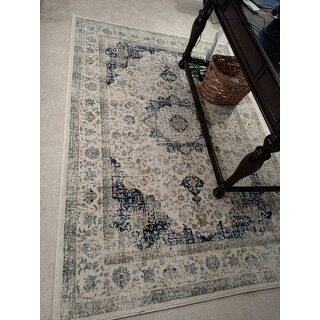 This rug is gorgeous in blue/ivory. While it's not my typical style, it works perfectly in my home office. It's not very thick, although by no means too thin, which may be a pro or a con depending on where you intend to use it. I have it on top of carpet; so, I needed a rug that was on the thinner side since the closet doors have to open over it. As another reviewer mentioned, the pattern isn't pixelated like you sometimes find on vintage or inexpensive Persian-style rugs. The colors are pretty true to what my monitor showed. The blue is a great royal navy, and there are pops of yellow, aqua, and gray accents throughout. I've included pictures, but they don't do it justice. If you're on the fence, go for it -- for the price, this rug is a fabulous buy. I'm incredibly happy I decided on this one. The colors are very true to what I see onscreen. 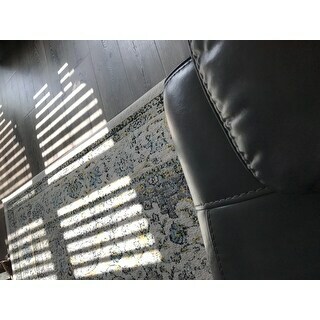 The rug is great quality for the price. It is not a super thick rug, but it's great for adding some softness under foot and we are very happy with it. I am using it with the Mohawk Home Supreme Felted Dual Surface Rug Pad and it adds thickness and softness to the rug. I'd recommend that. 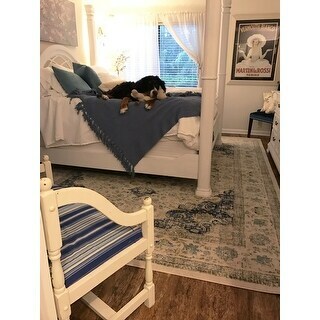 I got this rug for a small sitting area in our mast bedroom. colors and appearance are exactly as in the picture. it is soft under barefeet, and stays in place pretty well with just a writing desk and chair at one end (I have not put a pad under it). unlike some of these "vintage" Persian/Oriental style rugs, it does not look "pixelated." I am very happy with this purchase and glad I "chased" it to overstock from a more upscale web site. This rug is beautiful and made so nice it is a perfect area rug! We love this gorgeous rug. It adds just the right pop of color, but still sophisticated. I would recommend a rug pad to keep it from slipping. The base color is off white but does have some beige on the edge. The navy and teal blues and golden yellows make the rug pop, along with grey interwoven throughout. Cannot beat the price for this size rug! It took about 3 days for the rug to lay flat after laying furniture chairs on the sides. My dogs have had 2 accidents on the rug . The rug cleans up without leaving any stains. I used 1/2 strength Mr Clean and 1/2 water to clean the dirty areas. 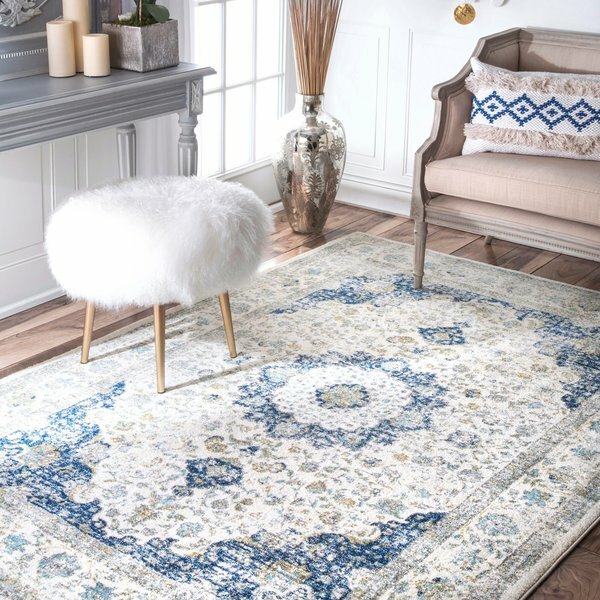 This rug is absolutely gorgeous and for the price you just can't beat it. We ordered it to go in the living room and it brightens the space and adds the perfect hints of blues and golds. Everyone compliments it! We purchased a rug pad to go under it which makes it even more plush. So far it is held up great--we would buy it again! 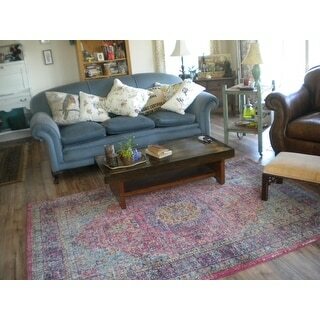 This rug is very true to how it looks on the site - and pulls the room together nicely. I ordered the grey. It's very hard from the picture to know what to expect, but there's a pale blue and a nice light ochre-yellow in the ivory base, along with the grey patterning. Works out great for me, as I put the rug on a blue-grey painted wood floor. The size is slightly longer than stated, which I expected from another reviewer and works great in my space. The rug flattened out after a couple of days, and does not shed. The pattern is subtle so it's not overpowering, but I feel that it will hide the inevitable spills and stains. I like it. This rug is great quality and the colors are brighter than the picture! There is a teal color along with a yellow also in it. 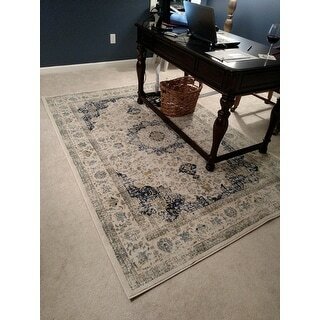 My husband chose this rug for his nautical themed office and we will be painting the walls to match the darker blue. The rug was 4" longer than stated which actually worked out perfect! This is not my "normal" style. I needed an area rug with blue in it. Saw this and immediately fell in love. It arrived promptly, well packaged and I am thrilled with this purchase. It looks exactly as pictured. Still makes me smile . Don't think about it if it appeals to you. Well worth it. Happy customer !!! 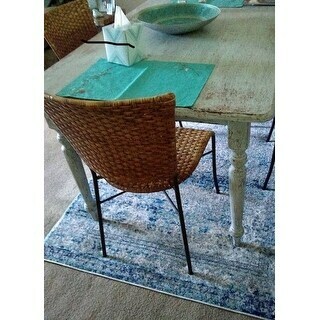 I gave this as a gift to a friend who wanted a distressed/vintage look to go with her dining table. She loves it. 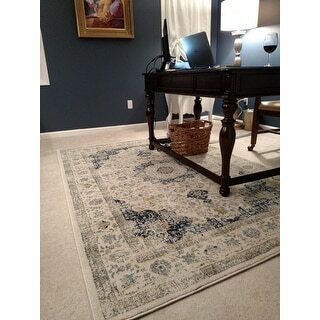 I think the blues are more blended and muted than they appear in the Overstock photo. This rug is absolutely stunning. I cannot say enough about it’s beauty and quality. I will definitely buy rugs from this brand again. Thank you for your beautiful design and craftsmanship. Great size and calming color and design. Great price and quality. I get so many compliments when friends and family come over. Easy to clean and vacuum and with the no slip pad it don’t budge. Love this rug, I purchased the blue colored one for my son's room and he absolutely loves it. great quality, and great price, I would highly recommend it. Love this rug. Adds great color to the room. Light and nice. Absolutely beautiful, purchased this for my living room as we have wood floors and it works lovely. Doesn’t slide around and is extremely fluffy and soft. Will purchase from this manufacturer again. Very good quality! Love the colors! "Hi, I would like to know the weight of this rug in the size 6’7”X9’." "The description says wool and the specs say polypropylene? This can not be wool and it's identical to the Safavieh Evoke sold here?" This is constructed with 100% Polypropylene. "Is the rug color more of a teal-blue color or a royal/cobalt blue?" The rug is more of a teal blue. "What is the pile high of this rug?" The pile height is 0.75 inch. "This rug was listed as an outdoor rug. This is an indoor rug, correct?" This is an indoor rug only. "I have an uncovered outdoor patio. Will this rug do well out in the elements? The pilings appeared thick and didn't know how well it would dry or if it would retain water." This item is not intended for outdoor use. "I asked if it is possible to get this rug in a 7ft.square"
No, this is not available in 7ft.square.